A few weeks ago, Katja Hahn reported such a malware sample on Twitter: link. The file is available here (SHA256 41a84ee951ec7efa36dc16c70aaaf6b8e6d1bce8bd9002d0ab5236197eb3b32a). But none of the analysis tools such as oledump or olevba detects any VBA macro. Even MS Word does not show nor run any macro. In his post "Malfunctioning Malware", Didier Stevens showed how he managed to rebuild and extract the macro source code from the document, using some low-level techniques. Let's investigate further: Is it a trick to avoid detection, or some kind of exploit? 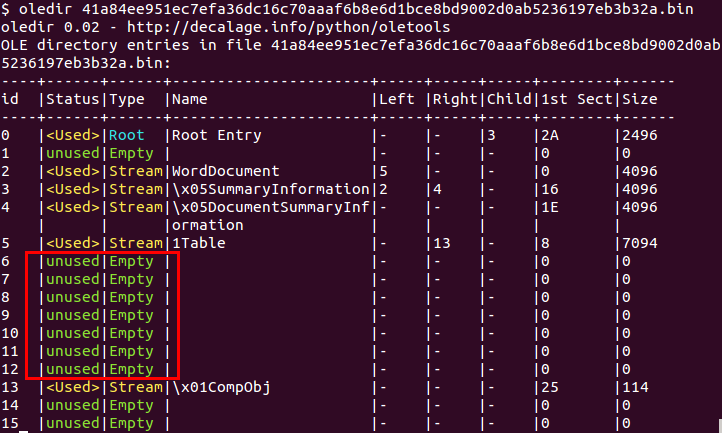 The OLE directory is an array structure in an OLE file containing names and locations of all the data streams stored in the file (see [MS-CFB]). Each entry in the directory may be in use, or empty. In our case, one can see there are several empty directory entries (id 6 to 12), followed by a non-empty one (id 13). Since entries are usually created in sequence, this is an indication that several entries may have been used and deleted later on. This also confirms that there is no registered VBA macro, because there is no storage named “VBA” in the file (see [MS-OVBA]). It appears that many sectors are marked as free, followed by used sectors. This is another indication that some streams may have been deleted. 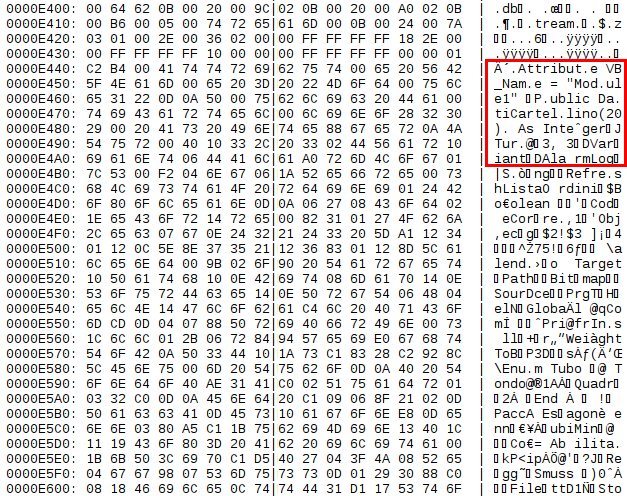 This also confirms that the VBA macro code seen in the Hex editor above at the offset 0xE440 is located in an unused sector (number 71, offset 0xE400). It is then very likely that the document used to contain VBA macros which have been deleted. It would have been odd for a malware author to send a document with deleted macros, because they would never be executed. I believe the document has in fact been sanitized by an antivirus or some kind of cleaning tool. For example, the F-Prot and McAfee antivirus engines provide such a macro removal feature. Another example is ExeFilter. 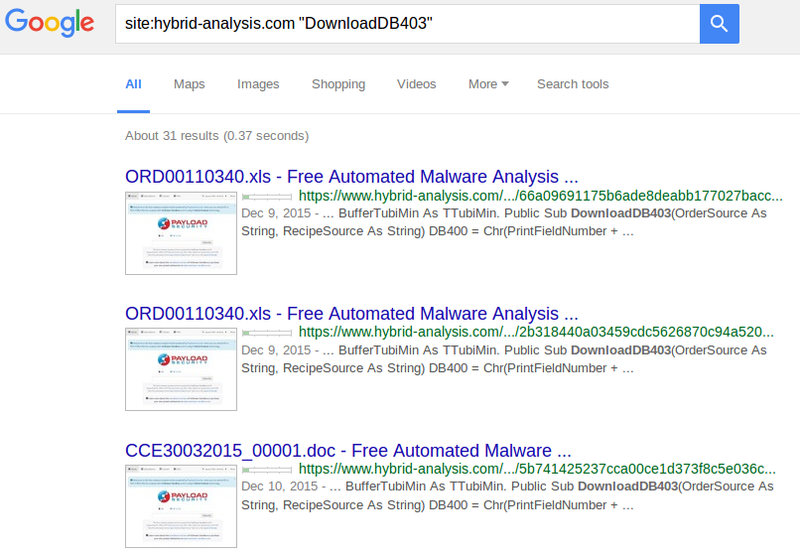 To confirm this, let's try to find the original version of the malware sample before it was sanitized. 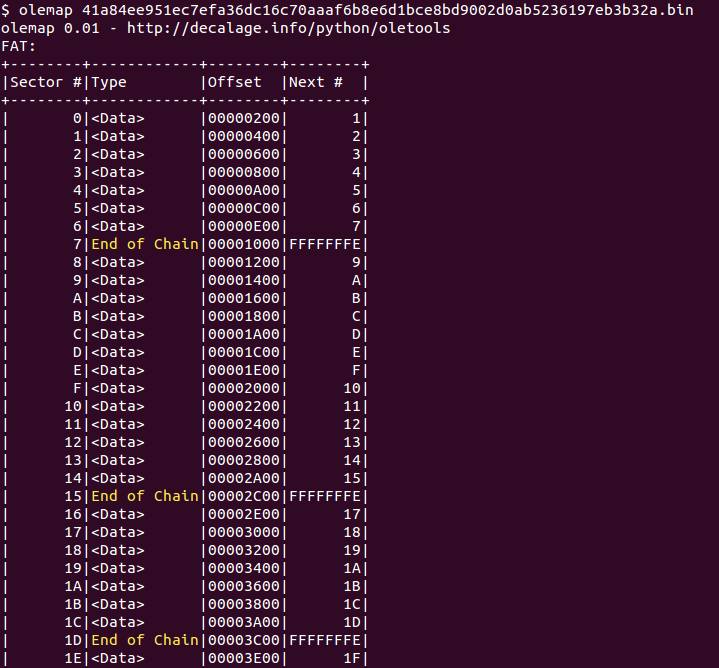 This is not straightforward, because the file has been modified: the original sample has different hashes. Furthermore, its original name is unknown. 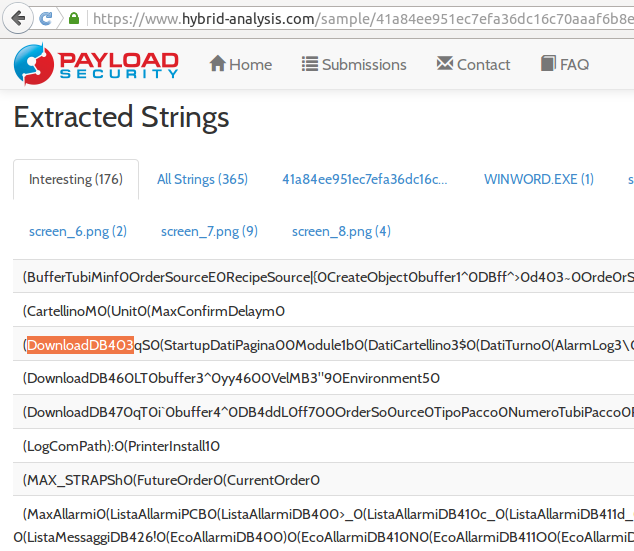 The issue is, the current version of hybrid-analysis.com does not provide any string search feature. Malwr.com can search strings within samples using the “string:...” syntax on its search page. However, for now that search feature often fails with a server error. This time, olevba confirms both files contain active VBA macros, with several characteristics of typical malware (see below). 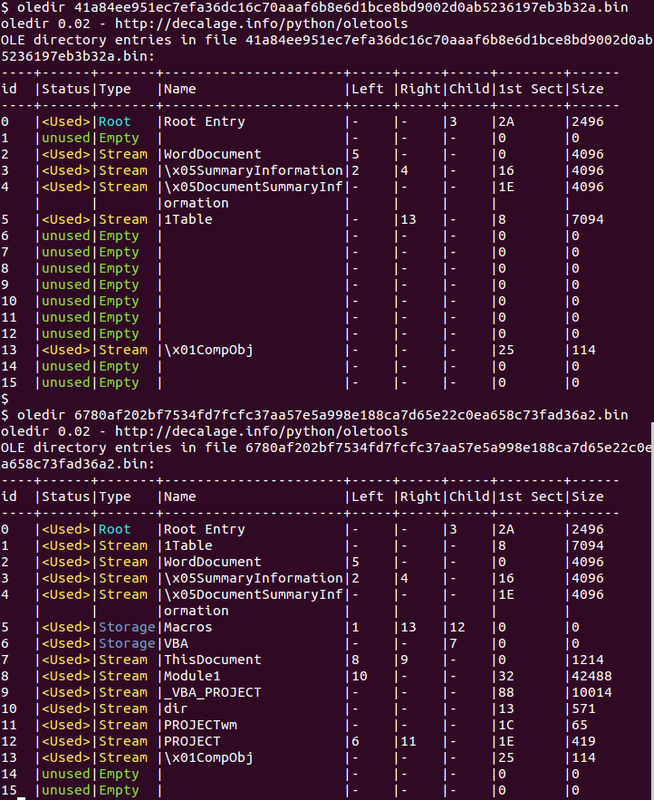 These two files are almost identical, apart from one line in the macro source code. This would not have been the case if the document had been modified in an editor such as MS Word. After this investigation, it is almost certain that the initial file which could not be analyzed (SHA256 41a84ee951ec7efa36dc16c70aaaf6b8e6d1bce8bd9002d0ab5236197eb3b32a) is actually not the original functional version sent by the malware author, but a sanitized version where the malicious macro payload has been disabled by an antivirus or a similar tool. Looking for similar malware samples containing the same specific strings, it is possible to discover the original, functional version of the file. And then malware analysis tools such as olevba or oledump can be used to extract and analyse the VBA macro source code. As a general recommendation, if you encounter such a malware sample that cannot be analysed by usual tools, first check if any payload actually runs when opening it in MS Office. If not, then it is very likely a crippled version of the malware, and not the original one. If in doubt, please report any bug or strange sample to tool developers (for olevba, use https://bitbucket.org/decalage/oletools/issues?status=new&status=open), just in case malware authors have found a new way to evade detection. As for antivirus engines and file sanitization tools, this example shows that it is not enough to delete streams containing macros. It is much better to also overwrite the corresponding sectors with null chars or spaces, to avoid triggering malware detection signatures on cleaned files.